Vintage Christmas ornaments are making a huge comeback as people enjoy feeling the nostalgia associated with them. Vintage ornaments have a look all their own, typically pastel and gently aged, with lots of faux snow sprinkles and glitz. And while many shoppers are snatching these up to hang on their trees, many folks are digging them out to use in other ways. This holiday season, why not try crafting your very own vintage Christmas ornament wreath? 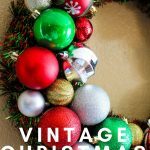 Making a vintage Christmas ornament Wreath is a great way to use these ornaments in a way that is fresh and exciting. Plus, it is also a great way to use up those ornaments that may be less than perfect. Creating one is a lot easier than you may think, so take a look below at all you need to know to make your very own. You might just be surprised at how easy it is! Silver and gold tinsel garland or red and green. A few things before you begin: For our sample wreath, we found all of the crafting supplies at our local Hobby Lobby. We printed off the 40% off coupon to take with us as the wreath forms are typically around $8. You want to pay a little more for the green crafting foam wreath as opposed to the white foam ones which tend to snap. For glue, be sure to use a low heat glue stick so it does not cause the glass ornaments to shatter. A high heat glue may be too hot. For the vintage ornaments, we gathered these in a variety of places. Some of the larger ones were found at a local antique shop for around $1 each. We were able to get the smaller ones at thrift stores for just a few dollars a bag. 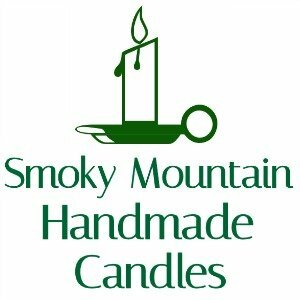 You can also find them on Esty but they may cost a little more. Let family and friends know you are searching for these and who knows, maybe they have some in the attic they are willing to share with you. 1. You first want to create the base of your wreath. Start by wrapping gold or silver tinsel garland around the form. Add a dab of glue in the spot where you begin to secure it to the form. Add a second dab to the end piece when finishing. Now, adjust the tinsel to make sure it is even and all spots are covered. 2. Here is where you really get creative. It is time to get those ornaments on! Start by placing a really generous dab of glue on the ornaments right before you are ready to place them. Place your larger ornaments first near the top, bottom, and each side of the wreath. 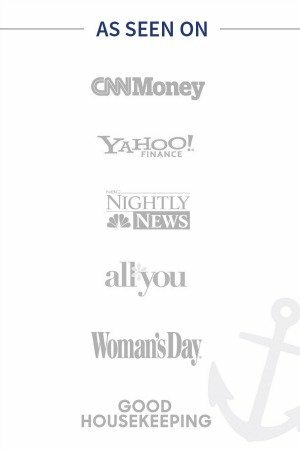 These will be your “anchor” ornaments that you will then fill in around. Press firmly to the wreath so the ornament has a chance to really secure itself. 5 or so large ornaments are all you need, as you will then use your medium and small ones to fill in around them. 3. After you have glued larger ornaments on, you want to start filling in with medium ornaments. Add glue to each ornament and press them firmly to the colored tinsel. Work your way around the larger ornaments, almost as if you are building around them. 4. As you are gluing, it is important to secure each ornament to the ornaments next to them. 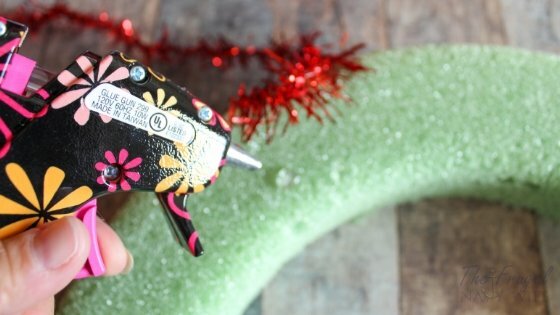 You can do this by adding a dab of glue to the side of each ornament and then press it into the side of the one next to it. This way they will act as reinforcement to each other. 5. Now start filling in empty areas with the smallest ornaments in your collection. Repeat the process by adding glue and securing them into any spots that need a little color. 6. Take a step back and look at your wreath. If any spots seem uneven, add more ornaments to add some bulk or finish the shape of the wreath. Once you get it hung up, you are not likely to notice little imperfections so don’t feel the need to see that it is perfectly symmetrical. 7. It is perfectly fine for tinsel to show through. In fact, it adds some fun sparkle. So don’t concern yourself if you see some. It only adds to it! You are all finished! 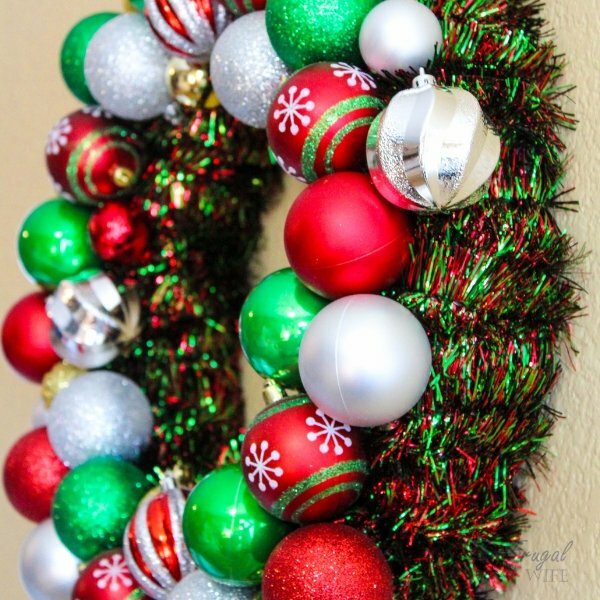 Hang your vintage Christmas ornament wreath on a wreath hook or drape ribbon through for hanging. This Christmas ornament wreath is sure to be a conversation piece in your house as it is sure to add some nostalgic holiday sparkle. Gather up your supplies and try your own hand at making one and see how easy it really is! Happy holidays, and happy crafting! 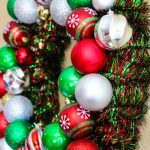 Making a Vintage Ornament Wreath for Christmas is a way to use ornaments in a way that is fresh and exciting. 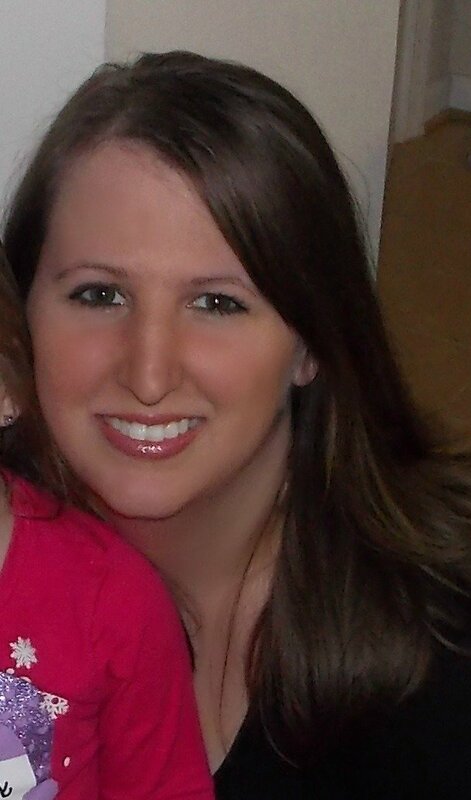 Creating one is a lot easier than you think. You first want to create the base of your wreath. Start by wrapping gold or silver tinsel garland around the form. Add a dab of glue in the spot where you begin to secure it to the form. Add a second dab to the end piece when finishing. Now, adjust the tinsel to make sure it is even and all spots are covered. Here is where you really get creative. It is time to get those ornaments on! 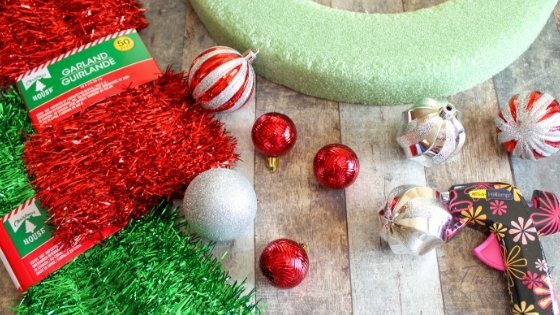 Start by placing a really generous dab of glue on the ornaments right before you are ready to place them. Place your larger ornaments first near the top, bottom, and each side of the wreath. These will be your “anchor” ornaments that you will then fill in around. Press firmly to the wreath so the ornament has a chance to really secure itself. 5 or so large ornaments are all you need, as you will then use your medium and small ones to fill in around them. After you have glued larger ornaments on, you want to start filling in with medium ornaments. Add glue to each ornament and press them firmly to the colored tinsel. Work your way around the larger ornaments, almost as if you are building around them. As you are gluing, it is important to secure each ornament to the ornaments next to them. You can do this by adding a dab of glue to the side of each ornament and then press it into the side of the one next to it. This way they will act as reinforcement to each other. Now start filling in empty areas with the smallest ornaments in your collection. Repeat the process by adding glue and securing them into any spots that need a little color. Take a step back and look at your wreath. If any spots seem uneven, add more ornaments to add some bulk or finish the shape of the wreath. Once you get it hung up, you are not likely to notice little imperfections so don’t feel the need to see that it is perfectly symmetrical. It is perfectly fine for tinsel to show through. In fact, it adds some fun sparkle. So don’t concern yourself if you see some. It only adds to it!